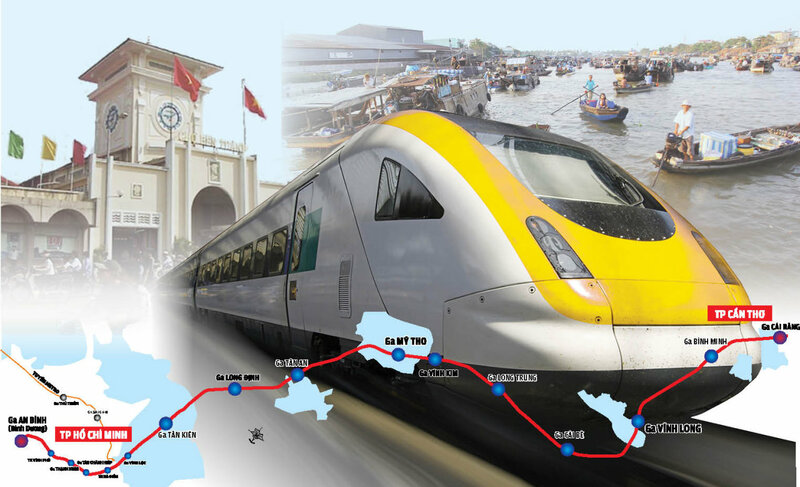 First proposed in 2008, the train route project connecting Ho Chi Minh City and Can Tho has undergone several phases of research and discussions. If the scheme is executed, a journey between the two cities will take only 45 minutes instead of the current three-hour drive. It will also have a positive impact on the socio-economic development of the two cities, as well as such neighboring provinces as Long An, Tien Giang, and Vinh Long. Chairman of the Ho Chi Minh City People’s Committee Nguyen Thanh Phong has recently requested the municipal Department of Transport to finalize the plan before submitting to the Ministry of Transport for approval. The railway route is expected to run along National Highway 1, passing a series of emerging urban areas, which cover some 11,720 square kilometers and are home to 14 million people. The train route will provide services for passengers and freight transport at speeds between 150 and 200 km per hour. The project was originally aimed at alleviating the high pressure from transport demand on roadway and waterway. By 2020, about 31.8 million passengers will travel in the area on a yearly basis and some 2.9 million metric tons of freight will need to be transported every year. An assessment made in 2008 showed that the Ho Chi Minh City- Can Tho railway path would cost some US$2.8 billion, excluding the expenditure needed for area clearance. A more detailed plan in 2013 suggested that the railway route would cost over $7.2 billion, of which site clearance accounted for VND48.7 trillion ($2.1 billion). The proposed route will span over 173 kilometers, passing 14 terminals, with the two main terminals in Di An Town in Binh Duong, Ho Chi Minh City’s neighbor province, and in Can Tho City. In late 2013, the Southern Science and Technology Institute proposed that the primary terminal be placed in Binh Chanh District, Ho Chi Minh City instead of in Dinh Duong. This would shorten the entire route to 134 kilometers, while the estimated cost was $3.6 billion. Speaking with Tuoi Tre (Youth) newspaper, a leader of the Ho Chi Minh City Department of Transport stated the agency would ask the Southern Science and Technology Institute to establish a detailed scheme for the project. The transport department will also seek the best approach to mobilize capital for the construction.